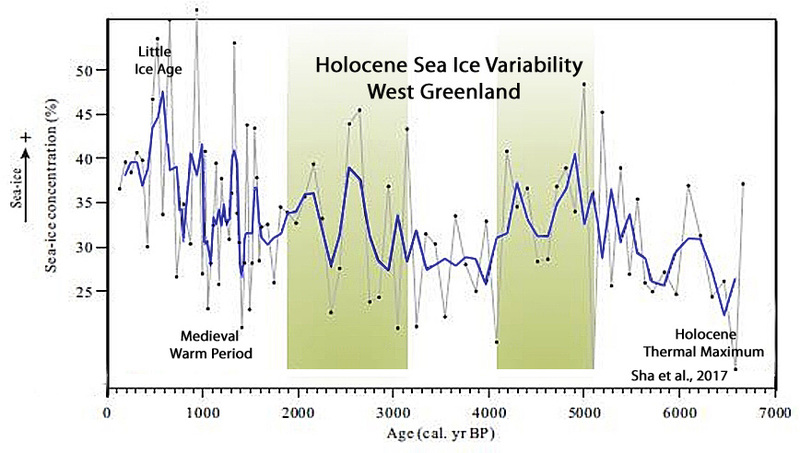 Since 2014, there have been several more scientific papers that have been published documenting the significance of natural forcing processes in the Arctic and how they may override a clear detection of an anthropogenic influence. But 2017 already seems to be an exception. Papers that document the dominance of natural forcing — or that don’t even mention anthropogenic forcing as a factor in the Arctic climate processes — keep on rolling in. As a case example, in a paper discussing the mechanisms involved in “Arctic amplification” and sea ice loss, Kim et al. (2017) never once mention anthropogenic forcing, or carbon dioxide, as mechanisms affecting the Arctic climate. 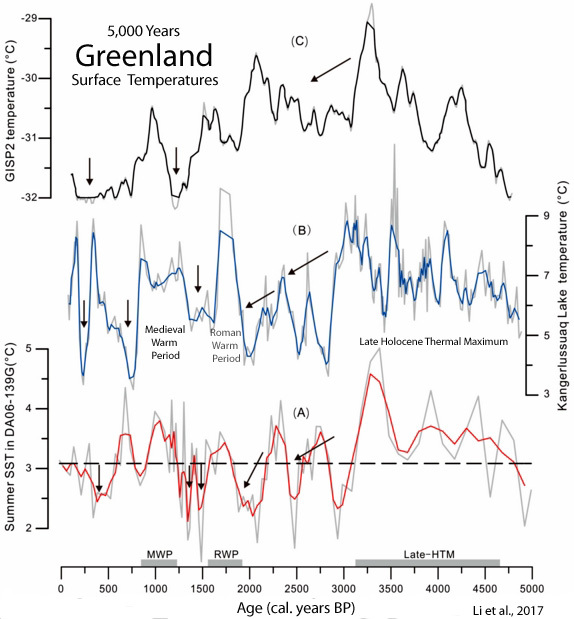 In fact, in citing several other authors, they acknowledge that the physical processes involved in the forcing of Arctic climate are “subject to debate” and remain “an open question.” In other words, not only is the position that humans exert a dominant influence on the Arctic climate not “settled science”, the anthropogenic influence may be so muted a factor that it is not even worth mentioning in a paper discussing forcing mechanisms. 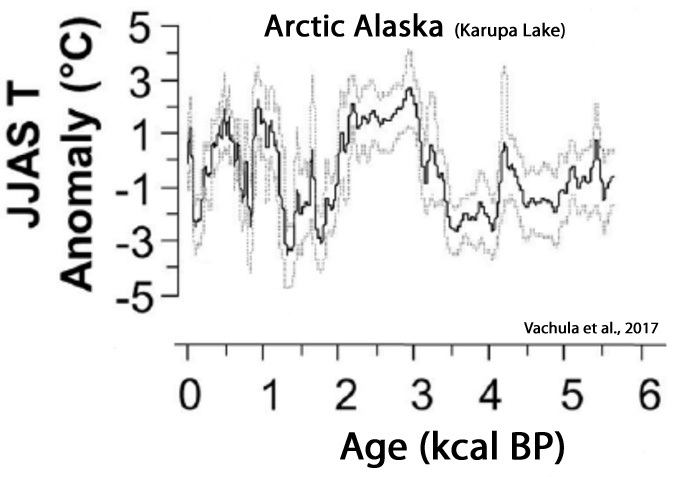 Two months ago, Dr. Ding delivered another Nature paper — this time with 10 co-authors — that once again emphasized the Arctic’s natural variability, specifically the internal processes involved in the substantial reduction in Arctic sea ice since 1979. The scientists concluded that as much as 50% of the Arctic sea ice decline in the satellite era has been natural, and that anthropogenic forcing may play a much smaller role than has previously been assumed in climate models. Many other newly-published papers advance the position that natural, non-anthropogenic processes are significant or even dominant factors in shaping the Arctic climate. A total of 15 are cited here categorically. 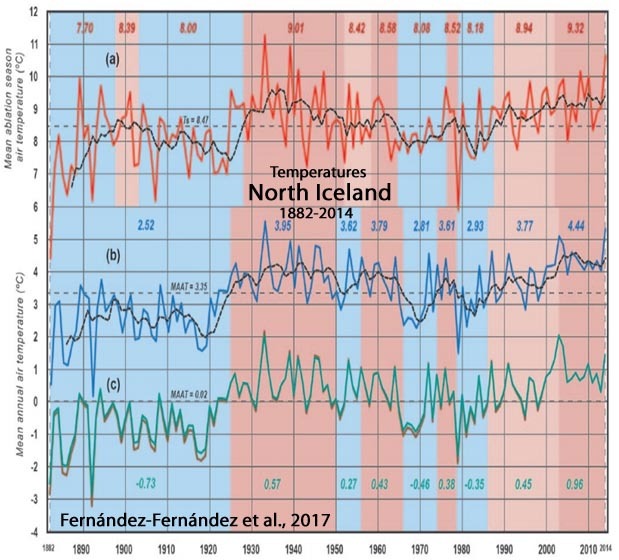 The instrumental record (HadCRUT) for Arctic temperatures indicates that there has been no significant net warming in the Arctic during the last ~80 years. 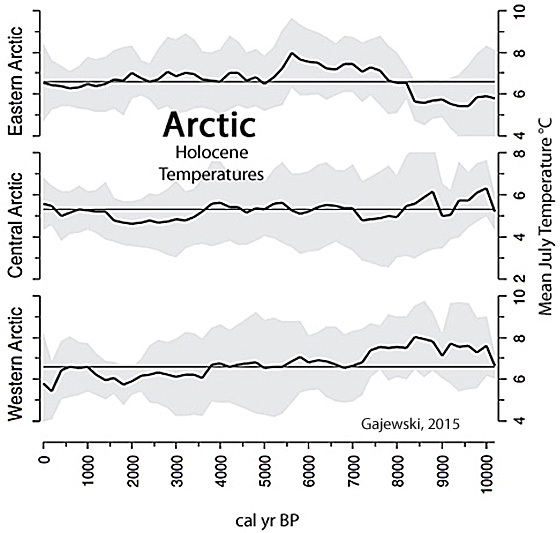 Newly published papers also affirm that much of the warming of the Arctic occurred before 1950, or before humans began emitting CO2 in large quantities. I have no problem with you being a glass half full kind of person but the 3 papers only show that some, not all of the Arctic warming comes from unforced natural variability. They show that scientists have no problem looking for causes of warming that are natural in origin. 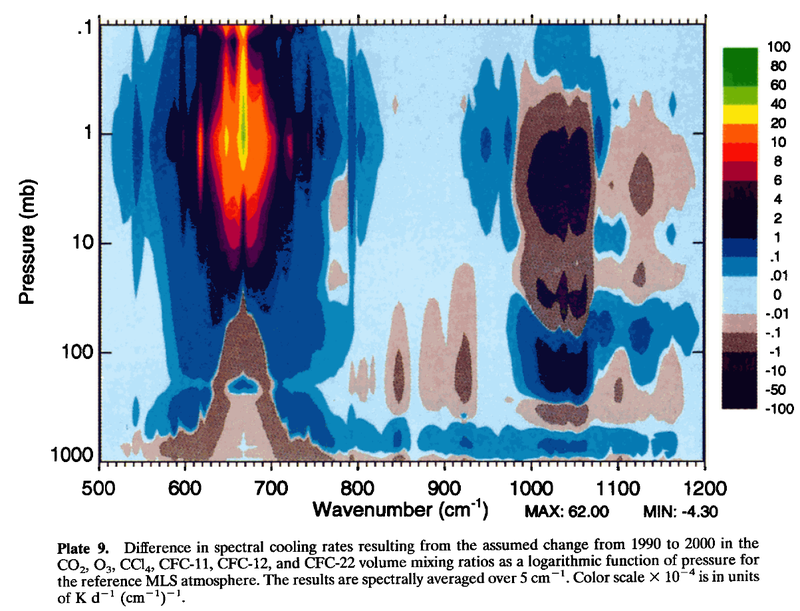 They also see “an increase of surface downward longwave radiation” caused by increasing levels of CO2. That would be nice if however Science still has no complete, cohesive, and verified model of how water works, without this basic knowledge how can anyone believe that climate can be understood or accurately modeled? Yes, water and all it’s attributes are not well understood especially during the transition of vapor to liquid to solid and the reverse. And what exactly happens when ice dissociates to vapor without the usual intervening liquid state. So how do they model clouds in the polar regions when H2O goes through all these transition states. They use ‘estimates’, or for the non-scientist, they guess. What are the energy states operating in and around clouds? Now add the variable atmospheric chemistry of real localities. And do the models allow for all of water’s anomalies? Also see http://www1.lsbu.ac.uk/water/water_anomalies.html for a list and explanation of water’s known anomalies. No, CO2 was specifically NOT mentioned. As you say, they only got it part right. soot, and industrial residues etc, may have a small effect.. as would Russian icebreakers. But nothing to do with CO2. Correct. 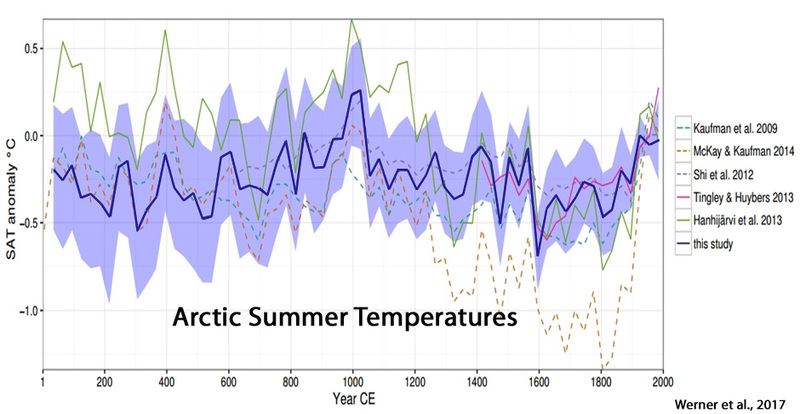 The Arctic sector also cooled by more than twice the global average between the 1940s and 1980s. So what is your point here? 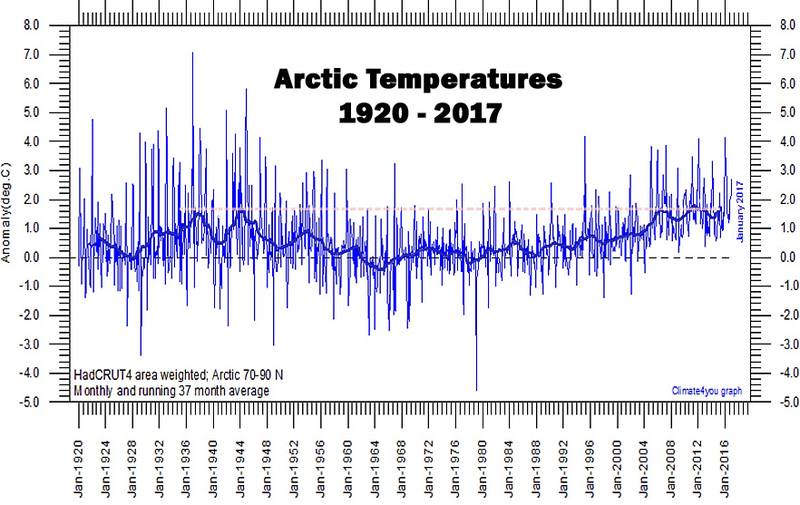 Has someone said the Arctic hasn’t warmed since 1979? I have no idea what your objection is here. Fan and Young didn’t mention CO2 as a factor in the greenhouse effect. Including the preceding sentence doesn’t change anything. It is well known that water vapor and clouds dominate the theoretical greenhouse effect. CO2 only accounts for about 3% to 20% of the total greenhouse effect…so it’s not surprising that it wasn’t mentioned as a dominant factor. “The scientists concluded that as much as 50% of the Arctic sea ice decline in the satellite era has been natural”………. Using words like “significant” or “dominant” are not synonymous with “all”, Craig. On the other hand, the authors themselves used these very same words that I used. Why would you find it intolerable to think that the Arctic climate would be significantly driven by internal/natural processes, anyway? Why must you believe that humans are the dominant cause of ice melt in the Arctic, and why characterize those who conclude otherwise as “glass-half-full” non-realists? Considering our discussions on P Gosselin’s May 14 post, I’m surprised you accept the idea that an increase of surface downward longwave radiation would have a warming effect. I expect all climate to be subject to internal/natural processes, but that does not disprove the fact that increases in downward longwave radiation from increasing CO2 levels also has an impact. However there NO observations or experiments that shows downward longwave radiation specifically from increasing CO2 in the lower atmosphere causes any warming. It is very arguable that in a convective atmosphere it can not. There is only the belief in a theory that keeps such a notion afloat! 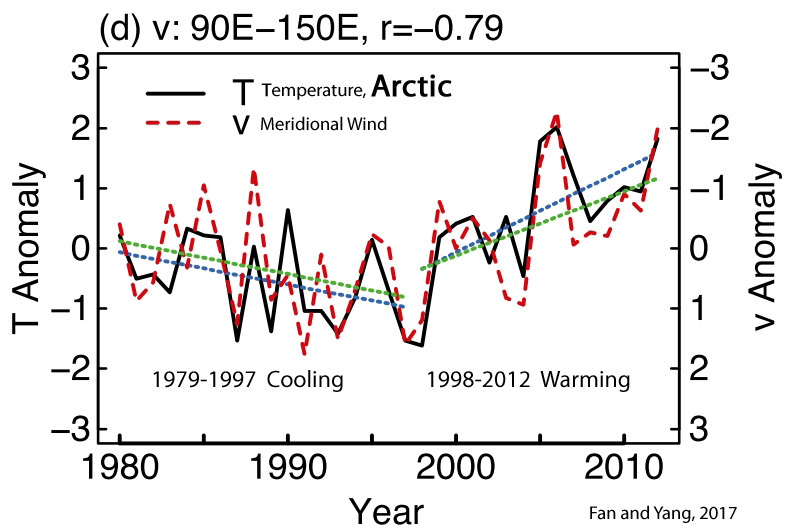 Are you disagreeing with the Fan and Young paper that downward longwave radiation warms the Arctic? Or are you saying that the LW radiation from CO2 is special and it alone does not warm? The additional downwell LW radiation from CO2 has been measured in the field. Clouds are known to play a pivotal role in regulating the local SEB [Surface Energy Balance], with competing warming and cooling effects on the surface. … The satellite-based cloud observations allow to estimate the cloud impact on the SEB [Surface Energy Balance]. … The annual mean CRE [Cloud Radiative Effect] of 29.5 (±5.2) W m 2 provides enough energy to melt 90 Gt of ice in the GrIS [Greenland Ice Sheet] ablation area during July and August. … The snow model simulations, which capture the evolution of the GrIS SMB [Surface Mass Balance] from 2007 to 2010, indicate that clouds warm the GrIS [Greenland Ice Sheet] surface by 1.2 (±0.1) °C on average over the entire period [2007-2010]. CO2 forcing may have a very modest impact, as cloud radiative forcing dwarfs CO2 forcing in both the shortwave and longwave. Therefore, any 0.000001 change in atmospheric CO2 will be easily overwhelmed by changes in cloud cover, which dominate the changes in the radiation budget. That’s why believers tend to ignore cloud radiative forcing — or pretend it doesn’t exist. 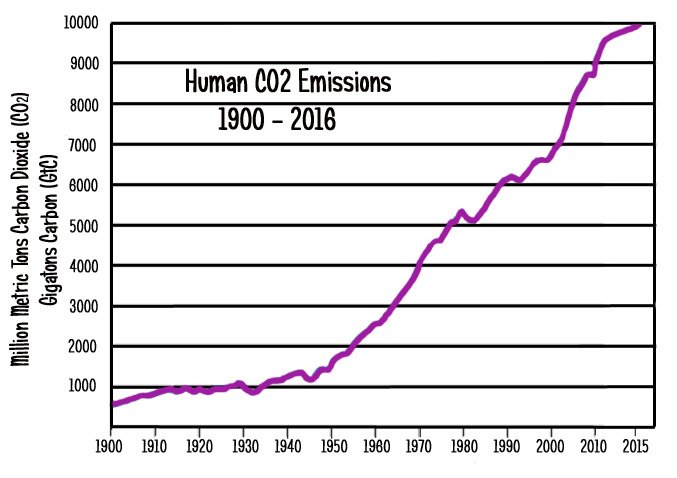 The additional LW radiation alleged from CO2 for the 2000-2010 period was a mere 0.2 W m-2 for the 22 ppm CO2 change (Feldman et al., 2015). Again, that is a modeled result. In contrast to 0.2 W m-2 of alleged CO2 forcing, the cloud cover changes since the 1980s has elicited a forcing that is several times greater. You’re actually paying attention rather than just ignoring what we say like Sebastian and sod do. There’s hope for you yet. See, as a true skeptic, when Andy (who is more convinced than I and far more likely to use words that imply certainty) says something about LW causing evaporative cooling at the surface, I am able to cite scientific backing for his claim from a database that I’ve personally compiled. That doesn’t necessarily mean that I agree with what the scientists writing those papers actually wrote, as I am aware that there are others who may disagree. That’s precisely why I do it…I like considering all sides. It’s probably similar to the reasons why someone like Dr. Curry allows guest authors who ascribe to “consensus” science to post on her blog. I love that. I’m probably more aware of the arguments in favor of your views than you are, as I expose myself to all points of view. Correct, it doesn’t “disprove” that CO2 increases might maybe possibly have an impact on ocean temperatures (although it has never been “proven” in the first place, of course). But, on the other hand, if the degree or magnitude of that alleged/modeled impact is vanishingly small relative to the impact generated from changes in other climate-forcing variables, then I think I can be forgiven for not taking the tiny change in the atmosphere’s CO2 concentration as seriously as people like you do. We’re talking magnitudes here, Craig. Not either/or. IR can have an impact on ocean temperatures, but that impact may be so minimal as to be almost undetectable. Do you have a paper showing the specific wavelengths emitted by CO2 act differently than the rest of the lowngwave radiation known to impact climate? Clearly shows that low altitude emissions are from H2O, not CO2. AndyG55 … the graph you are linking to is NOT showing emissions, but heat loss. Do you know the difference? with ZERO PROOF OF CO2 WARMING. CO2 emissions have a maximum path length of 10m or so in the lower atmosphere.. Even a mathematical inebriate like should be able to figure things out !!! odd.. I thought you said emissions were heat..
Seb eats yet another sock, due to his MANIC foot in mouth disease. the ASSUMED change from 1990 .
seb doesn’t even read the figure titles !!! When did I say that emissions were heat? Heat transfers in only one direction, towards the cold. Emissions (of energy) occur in every direction. 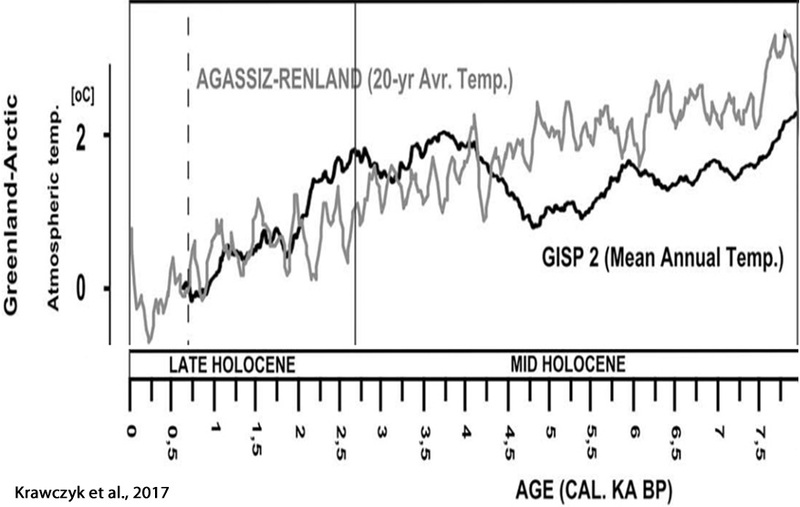 You two (you and Kenneth) still seem to think we (the “AGW scamers”) are saying that backradiation is actually heating the surface. That’s not the case. Any form of insulation will cause an increase in temperature while the emissions stay the same. It’s pretty basic physics and the atmosphere is Earth’s insulation towards space. Pretty simple. In FACT, test have been done in the double glazing industry, and it has been found that normal air is a BETTER insulator than CO2. That is because CO2 TRANSMITS radiant energy. That makes it just another conduit for surface and atmospheric cooling, just like convection. And of course, a tiny change in the balance of different cooling pathways, makes absolutely no difference, because the whole is controlled by the pressure/density gradient. Apparently you don’t know that double glazing (or triple) doesn’t really insulate from radiation losses. That is not their purpose and why would you fill the gap with anything at all? And if you’d do it, why not some monoatomic gas? What kind of industry tests if CO2 is better than normal air for this application? Anything that is not inert to LW radiation works as an insulator when put between the heat source (surface) and the heat sink (space). Some gases are more efficient insulators than others. But you already knew that and just wanted to troll me, right? Poor seb .. CO2 doesn’t BLOCK radiation, it transmits it, even better than normal air. So explain how CO2 concentration changes in volumes of + or – 0.000001 affect this process more than, say, changes in other factors affecting transmittance do (i.e., clouds). Did you ever wonder why it is that CO2 isn’t mentioned when scientists discuss heat flux factors? Of course not. That would imply that you are skeptical of what you’re told to believe. Did you notice that Fan and Young do not mention CO2 as a factor leading to an increase in LW radiative forcing? Why do you think it is they failed to include CO2 as a factor…since it is your belief that CO2 is the dominant factor affecting LW forcing? Coincidence? That makes it just another conduit for atmospheric cooling. Arctic sea ice levels have been essentially steady for the last 10 years. This is totally in line with the flattish top of the AMO cycle. That cycle is starting to head downwards, North Atlantic Ocean is cooling quite fast. Both MASIE and NSIDC are showing the slowest melt in the Arctic in over 10 years. MASIE has Arctic sea ice extent above that of 2006, 2007, 2008, 2009, 2010, 2011, 2014, 2015, and 2016.
ps, There is no doubt that we are still very much in a COLDER period of the Holocene. The only period that Arctic sea ice extent has been higher than current being the lead-up, during and the partial recovery from the Little Ice Age, the COLDEST period in the last 10,000 years. Refreshing to see real science being done instead of the endless political science, which the left worships. What also may be of interest is the difference from today of the nature of the oceanic CO2 gradient levels as reported in Glacial-to-Holocene Redistribution of Carbonate Ion Glacial-to-Holocene Redistribution of Carbonate Ion in the Deep Sea Wallace S. Broecker* and Elizabeth Clark, DOI: 10.1126/science.1064171. We have reconstructed the glacial-age distribution of carbonate ion concentration in the deep waters of the equatorial ocean on the basis of differences in weight between glacial and Holocene foraminifera shells picked from a series of cores spanning a range of water depth on the western Atlantic’s Ceara Rise and the western Pacific’s Ontong Java Plateau. 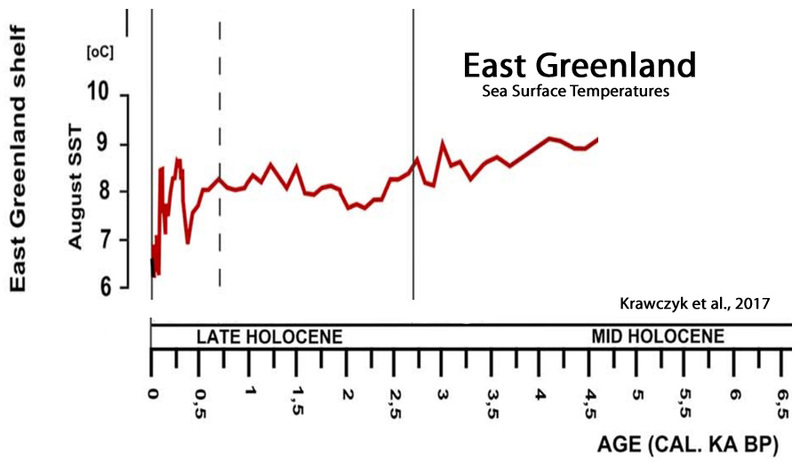 The results suggest that unlike today’s ocean, sizable vertical gradients in the carbonate ion concentration existed in the glacial-age deep ocean. In the equatorial Pacific, the concentration increased with depth, and in the Atlantic, it decreased with depth. In addition, the contrast between the carbonate ion concentration in deep waters produced in the northern Atlantic and deep water in the Pacific appears to have been larger than in today’s ocean.